The typical department store opens at 10am. A few customers are already outside with sales fliers in hand or an armload of items to return. The phone is ringing off the hook while the red light on the phone console flashes to indicate a flurry of customers who want someone to call them back–today, of course, and preferably first thing in the morning. This is how I start my day as a retail salesperson. I'm here to tell you what goes through my head as the doors are unlocked and I get ready to greet whoever walks through them. I'll also divulge some secrets of the trade that you can use to get better deals and better service while maybe giving me a little bit of a (well-needed) break. -- Compare your salary to a retail salesperson's. The salesperson knows what size you really wear. 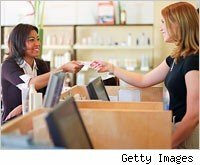 Most customers shuffle through the racks, pick out what they want, pay and leave. However, we do have the needy clients, too. She usually asks for a dress in a size 4; the salesperson suggests an 8. No, she wants a 4. The salesperson finds the 4 and brings it to the changing room. She also discreetly places a 6 and 8 on a chair nearby. Ten minutes later she hears a whisper: "Hello? Sales lady? Could I try the size 6?" She grabs the 6 and passes it along, while also hanging the size 8 on the outside of the door. In the end, the client leaves the store with a size 8 dress tucked into her shopping bag. Colleen Hollis, who owns a children's clothing store, notes, "We know what brands our store carries. A lady brought back a dress that looked similar to one we carry and it did have our sales tag on it." But on close inspection, Hollis noticed that while the dress was similar to one she sold, it wasn't from a manufacturer that she'd ever dealt with. "The customer had bought a cheap knock-off brand and our dress. She kept our dress, took the tag off and applied our tag to the knock-off brand dress to get a refund for the more expensive dress!" She laments, "The extent some people will go through to abuse the system amazes me every day." In most cases, even when an item is 50% off, a brick-and-mortar store is still making 100% profit on it. This is why Lezlie, a sales associate who didn't want her last name used, states, "My motto is never pay full price. I always wait for the items to go on sale." Of course, retailers hide the marked down items in the way back so that you have to pass all the newest pieces, with their 400% mark-up, to get to them. But hunting those items down will give your wallet a break without hurting the store one bit-though I must admit that splurging on the occasional hot-new-thing will make your commission-earning sales associate very happy.